To effectively manage your medium to large volume video collection, it is essential that you ORGANIZE it. With good organization, you will be able to locate, upload, configure, share and track your videos with ease. 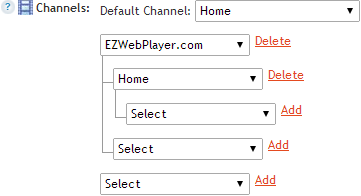 EZWebPlayer's powerful organization structure is called CHANNELS. By organizing in Channels, you SAVE TIME and effort: you don't have to create group parameters, add titles, or descriptions for every video you upload. It's a Once and Done environment. And, videos are cross channel shareable— each video can exist in multiple channels with either the same settings or different settings; also a Once and Done environment. 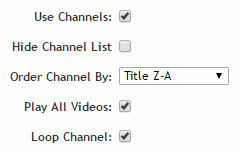 And Channels allow your viewers to easily access your library and choose the videos they want to view. When your videos are easy for viewers to access, they'll view more and stay on your site longer. EZWebPlayer's "Playlists" are groups of videos you place together in Channels (folders) or sub-channels in your EZWebPlayer Dashboard. You'll group videos into Playlists based on any criteria you choose. Group by type of content, most watched, by file format, by season, by promotion — whatever suits your needs and those of your viewers. Using simple controls on EZWebPlayer's Dashboard, you can use Playlists to define, store, and play videos one at a time, or in continuous sequence – in specified or random order. The Playlist displays the thumbnail image, title and description of each video. Once visitors have made it to your site, a primary goal is to KEEP them there. A Video Playlist can help greatly because it's a scrollable, clickable listing that invites your visitors to view the rest of your video library. When a video ends, a playlist floats on the surface of your player. You can enable or disable the Video Playlist, and your visitors can show or hide it. The Playlist shows the video thumbnail image, the title and the beginning description. Organize videos further with sub-channels. It's just like nesting folders within folders on your computer desktop. Simply create sub-channels within your main Channels folders. Organize for easy access by grouping related videos together in sub-channels up to five levels deep.